This painting is a fine example of the type of court portrait en vogue during the first half of the 18th century. 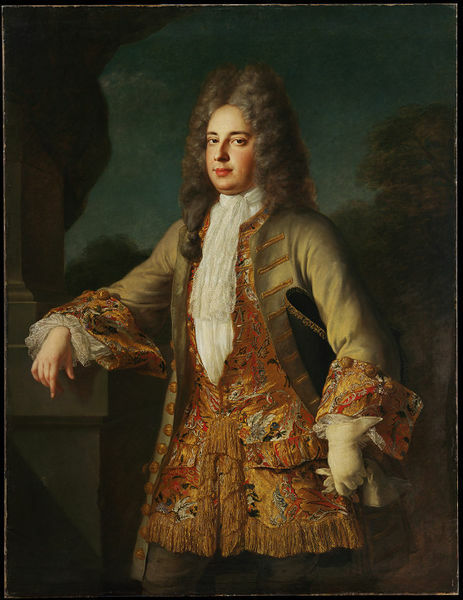 The sitter wears a rich woven silk waistcoat trimmed with gold fringes, which provides a good example of French fashion during the first quarter of the 18th century. 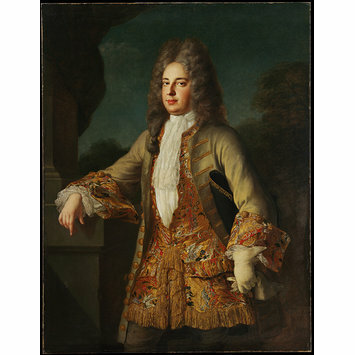 The sitter could not be identified but he was probably an important figure of the exiled Stuart court in France of which Belle was the official painter. Three-quarter portrait of a man wearing a rich velvet over a brocade waistcoat with a long lace cravat, lace at the wrist; one hand leaning against the base of a column and the other in a white glove holding the second one in the same hand; a three-cornered hat tucked under his right arm; distant trees in the background. Purchased at Sotheby's London, 19 July 1978, lot 33, at the instigation of the Textiles department. This painting was once thought to be a portrait of Matthew Prior, the English poet, diplomat and politician, but comparison with another attested portrait of Prior by Belle in St John's College, Cambridge, excludes this identification. Belle, like most of the portrait painters of his generation such as Nicolas de Largilière (1656-1746) and Hyacinthe Rigaud (1659-1743), was a master in rendering precious textures and materials in his portrait paintings. 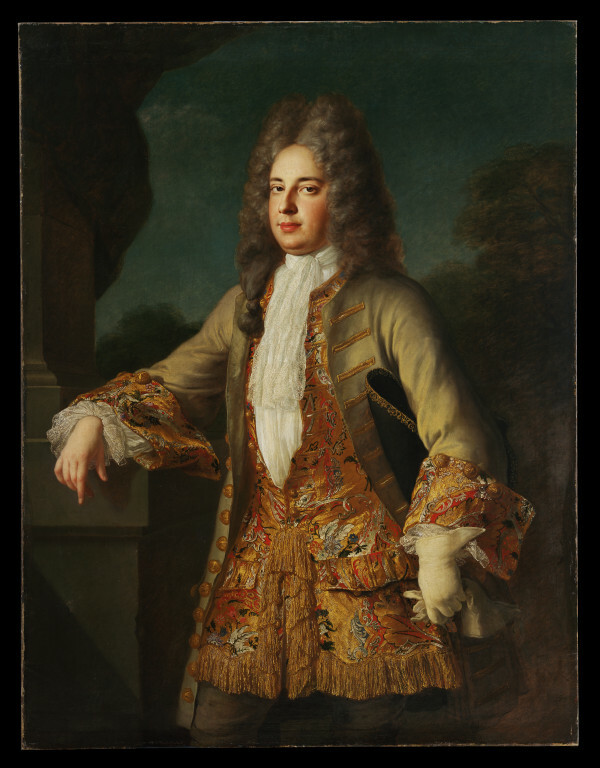 The garment worn by the sitter in this painting is particularly remarkable from this point of view and is the reason why the painting was acquired by the V&A at the instigation of the Textiles section. It is an accurate representation of the magnificent woven silk waistcoat with gold fringes, made from a French silk that can be dated 1710-1712 by comparison with designs by James Leman (1688-1745). It would have been very expensive, perhaps equivalent to two years wages for a skilled artisan. Similar precious silk dress can be seen in other portraits by Belle including Louis XV and the Infante Marie-Anne-Victoire, Musée National des Châteaux de Versailles et de Trianon, Versailles (Inv. 9380), executed between 1722 and 1725, and Portrait of Captain Hercules Baker (1689-1744), Christie's London, 26 Nov 2002, lot 11. Although the sitter could not be identified, it has been suggested that he may have been a diplomat who attended the negotiations which led to the Treaty of Utrecht at the end of the Wars of the Spanish succession. Belle was working in Paris at this time when he painted the portrait of Matthew Prior now in Cambridge. Thornton, P. K, Baroque and Rococo Silks, London, 1965, pl.496. Camus, F., 'Alexis-Simon Belle portraitiste de cour (1674-1734)' in Bulletin de la Société de l'Histoire de l'Art français (Année 1990), Paris, 1991, p. 33, fig. 18 and cat. 30, p. 60.